On Tuesday, February 20th, 2018, GFDD hosted a special screening of the documentary "Sol Caribe" (Caribbean Sun) with the presence of Dominican artist Carlos Alfredo Fatule. This event, part of GFDD’s Dominican Film Showcase and Dominican Get-Togethers initiatives, was celebrated to commemorate the Dominican Republic’s independence by rejoicing in the best of its music and culture. “Sol Caribe” is feaature length documentary about the roots, development and current state of Dominican music with its four main popular genres, salsa, merengue, bachata and son as expressed by the voices of 12 of its greatest musicians: Milly Quezada, Wilfrido Vargas, Joseíto Mateo, Fefita La Grande, Johnny Ventura, el Cieguito de Nagua and Francisco Ulloa, among others. The documentary is based on an unprecedented series of concert tours made by these pioneers of Dominican music and serves as a mechanism to introduce people all around the world to these influential beats that developed in the cradle of America. Directed by acclaimed Dominican filmmaker, Félix Limardo using vibrant images and sound, the movie skillfully showcases the evolution of these various styles and rhythms that originated in the Dominican Republic region. 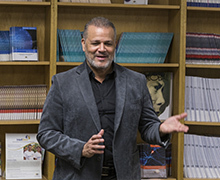 After the screening the audience enjoyed a lively conversation with Carlos Alfredo Fatule, a professional Dominican singer, film and theatre actor with over 30 years of experience who has also produced, directed, and hosted numerous successful television and radio shows. He is also a musician, writer, lecturer, and entertainer. Among other current roles and activities, he offers training sessions for young and aspiring theatrical performers. Fatule engaged with participants in an intimate discussion about merengue and what it means for him as a Dominican artist that have succeeded with it, but also as a key element of the Dominican culture and identity, especially when living abroad. The event, hosted at GFDD-DC office, was moderated by Maria Victoria Abreu, GFDD’s International Affairs and Socio-Economic Development Program Manager. During his visit to Washington, DC, Fatule was also greeted by the Ambassador of the Dominican Republic to the United States, Mr. José Tomás Pérez, and members of the Embassy’s team.